Denise Kane was chosen as the 2006 Elizabeth Butler Award winner in recognition of her remarkable career dedicated to meeting the needs of vulnerable children and improving the systems in place to protect them. Ms. Kane was the first graduate of the doctoral program to receive the award. 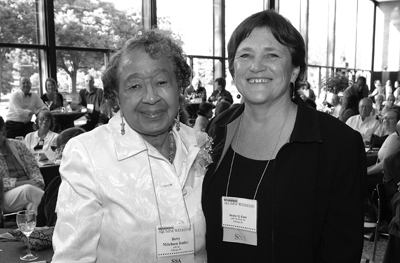 “I believe her ability to always return to the question of, ‘What is good for children,’ and to continue to support efforts to improve policies and practices to insure the best available outcomes for these children are based solidly on her integrity and high level of analytical skills,” wrote SSA Professor Emerita Elsie M. Pinkston in her nominating letter. “I cannot think of anyone who is a more qualified candidate for this award.” Illinois Governor Jim Edgar appointed Ms. Kane as the first Inspector General of DCFS in 1993. The Office of Inspector General was created to reform and strengthen the child welfare system and is responsible for investigating allegations of misconduct throughout the system. The Illinois General Assembly approved the creation of the office with a unanimous vote. In the role, Ms. Kane has helped regenerate the system statewide by instituting a number of improvements. In her first annual report to the Illinois General Assembly in 1994, she made recommendations regarding a range of personal and systemic issues within the agency. Believing that sound ethical judgment is the foundation of good child welfare practice, one of Ms. Kane’s first propositions was that DCFS adopt a code of ethics stating the values and responsibilities of the child welfare profession. Another of Ms. Kane’s significant contributions is the Child Welfare Ethics Advisory Board. The board is made up of representatives from the fields of child welfare, psychology, law, law enforcement, medicine, and moral philosophy. Meeting at least six times a year, the board accepts ethics inquiries both from within DCFS and from private child welfare agencies. Her interest in child welfare dates back to her college years. While earning her bachelor’s degree in sociology from Loyola University, Ms. Kane took time off to work as a VISTA volunteer in a housing project in Baltimore. There, she created new programs for 80 percent of the project’s population under the age of 18. She has worked as a Probation Officer for the Juvenile Court of Cook County, the Supervisor of Children and Adolescent Outpatient and Mental Health at the Association House of Chicago, the Director of Social Services for the Juvenile Court Public Guardian’s Office at DCFS, and the Associate Director of the Citizen’s Committee of the Cook County Juvenile Court. A foster parent herself, Ms. Kane has won numerous awards over the past 30 years, including the Benjamin B. Green-Field Award for outstanding work in child abuse prevention and the Foster Parent Award at the Association House Annual Meeting in 1980. The SSA Alumni Association presents the Elizabeth Butler Award semiannually. The award honors an alumna/us who graduated not less than five and no more than ten years prior and has shown a strong commitment to social change. The award also honors exceptional leadership in an agency or within a community; meaningful contributions through research or publications; or creativity demonstrated by traditional, non-traditional, or innovative approaches to practice.